4k00:57SHIBUYA, TOKYO, JAPAN - NOVEMBER 2017 : Walking view of SHIBUYA CENTER-GAI street at night. Shot with stabilizer camera. 4k00:20 BANGKOK, THAILAND - CIRCA OCTOBER 2018 : Scenery of THANIYA STREET. This area is also known as “little Japanese town”. 4k00:07Tokyo, Japan: October 3, 2018: Pedestrians walking in busy and famous Shibuya Crossing in Tokyo. Shibuya Crossing is the busiest crosswalks in the world. 4k00:31NEW YORK CITY - JUNE 6, 2015: Street traffic and pedestrians at night on Times Square on June 6th, 2015 in NYC. 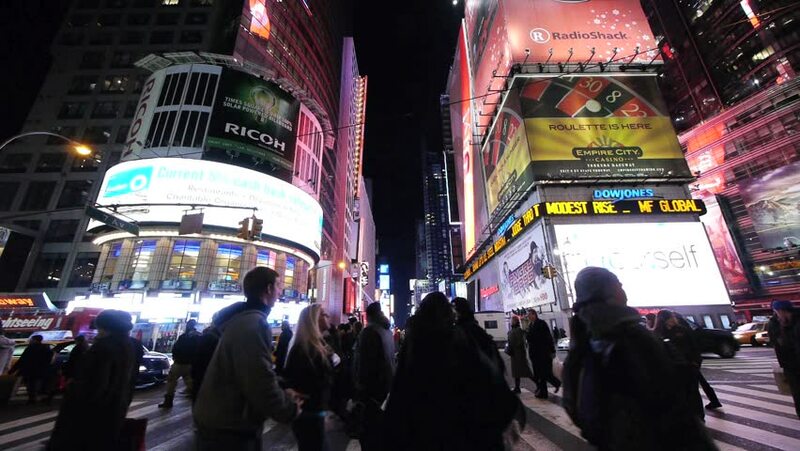 Approximately 330,000 people pass through Times Square daily, many of them tourists.